Enjoying life…one meal at a time! Hey there! Thanks for dropping by Gourmand4life! Take a look around and grab the RSS feed to stay updated. See you around! With the weather cooling and other subtle (and not so subtle) signs that fall is here Amy & I decided to try our hand at pickling recently! We are both originally from Central New York and back home we have a group of friends (some old school Italians, some just damn good cooks!) that get together every fall and on one day pickle a massive amount of peppers. Everything about these peppers are incredible, from the peppers themselves, to the pickle juice which is almost equally valued for it’s ability to turn hard boiled eggs into the most phenomical pickled eggs you can imagine! 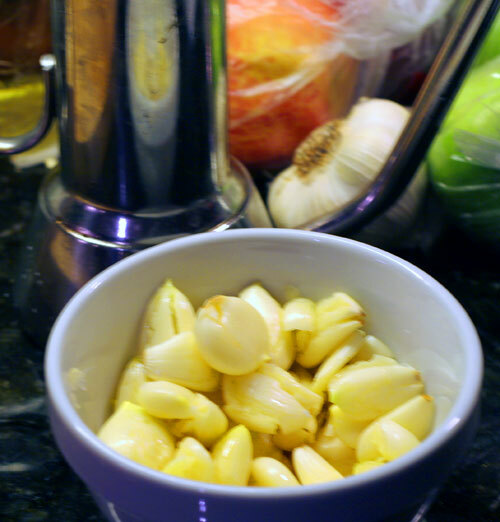 It is also delicious on pasta with some shredded cheese & cracked black pepper (as Amy will tell you!). The peppers mentioned above were the muse for our rendition. So we called one of our friends to get the low down on how they make them. We then did our best to mimic their approach. In the end we failed to be honest, but ours are still pretty tasty. Our next move is to sit down with these pickling pros and figure out where we can improve the process, and where we diverted from their tried and true ways! Originally, the guys used a mix of Hungarian Hots & Cherry Peppers, but they have since replaced the Hungarian Hots with Hot Banana Peppers (easier to get apparently). We may have hit the farmers markets at a bad time for peppers but we didn’t see a large selection of any type of hot peppers and zero Hungarian Hots or Hot Banana Peppers! We did our best to search out moderately hot peppers, but ended up with an assortment of fairly mild peppers with a few jalapeno’s thrown in for good measure. Mind you, in order to come to this combination we made stops at the Hope St. Farmer’s Market, Whole Foods, Shaw’s, and the Asian-American grocery store in Cranston. With the peppers procured, we donned our gloves and started chopping. 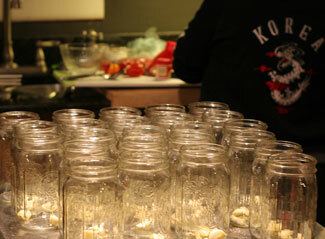 When finished, we had enough to fill 20 quart sized Ball jars. To the chopped peppers we added a mix of finely chopped flat leaf Parsley, Basil Leaves and olive oil. We mixed this well (using a plastic trash bag made it an easier chore) and let it sit for a while as we prepared the brine & got the jars ready. The brine was simply a mix of apple cider vinegar & water, basically 50/50, but with slightly more vineager than water so maybe 55/45 along with some salt & pepper. That was placed in a pot and set to boil. As that was heating we placed all the Ball jars on the counter and in each placed the following: a sprig or two of Dill, 2 cloves of garlic, some peppercorns, 1/2 t of alum, and perhaps a 1/2 teaspoon of Trinidadian pepper sauce (I was afraid our peppers weren’t going to be spicy enough!). 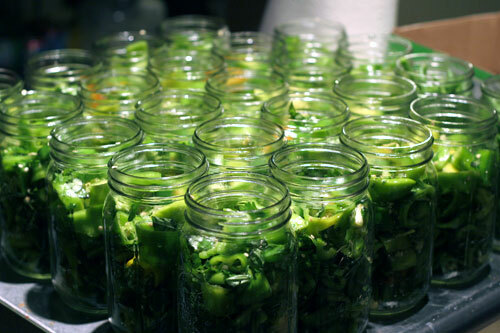 We then jammed as many peppers into each jar as we could. Once the jars were full we dipped a pitcher into the near boiling brine and begun filling the jars. As each jar was filled with the hot brine we placed a lid on the jar and moved to the next one until they were all filled. As I recall from making the peppers with “the guys” the jars would seal themselves after a few minutes. Of course, none of ours sealed! Luckily I have a Food Saver with a Ball jar attachment, so I used that to force seal all the jars. It was late at night on a Saturday when this process was finally finished (~2:00am-ish), so we placed the jars back in the boxes and set them aside for 2 weeks then finally headed to bed with a terribly messy kitchen! Two weeks later we opened one of the jars and snacked on a few of our homemade pickled peppers! I should start by saying that they are pretty good…just not nearly as good as the ones from our friends in Central NY! Their brine is delicious. Just sipping it from the jar is delicious! It’s a harmonious taste of vinegar, peppers, spices and oil that tastes way better than the sum of it’s parts. 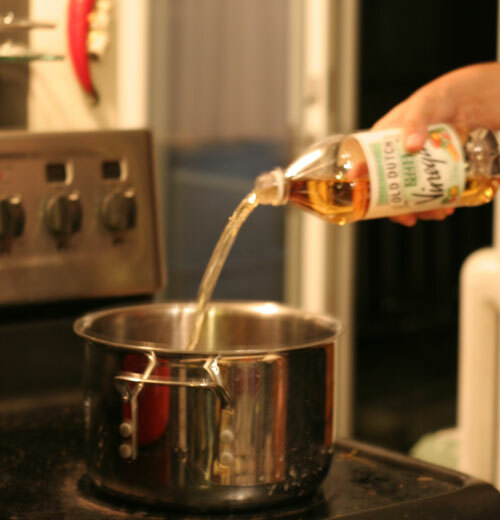 Our brine on the other hand tastes like what it is, vinegar & water! We did like how nice and crunchy our peppers were though, and they actually taste pretty good so we are actually happy with them, but now we need to sit down and figure out how to improve. Now our mission is to eat 20 jars of peppers as quickly as we can so we can try again! 1. I think they didn’t seal because we didn’t pre-heat the jars. 3. Need more olive oil in the jars. Perhaps pouring some oil in each jar prior to the hot brine?! Any of you pickling pro’s out there have any suggestions?! Taste of Providence V: Adventures in Gluttony! Homemade Kimchi: Deliciously Spicy Raw, Fermented Vegetables!